As I mentioned in an earlier post, there is a clear difference in the way photojournalism is approached. In fact, I don’t think I can even call it photojournalism, because many times, newspapers don’t care to tell a story or further it with a picture. A picture is simply a colorful space filler on the page. However, since that post, I think I’ve come to understand why so many of the events covered have such bland photos. One thing I noticed while in India is that many people consider themselves important. This idea is accentuated through the felicitation ceremonies, at which guests are shown that they are, indeed important. Thus, when its time to capture the moment on film, photographers naturally crowd around what they believe to be the most important subjects, the people, and focus their shots accordingly….and the product is usually a grip-and-grin handshake photo with the dignitary. Journalism ethics is also a bit different, not to say that one is wrong and the other isn’t. Two different cultures, two different codes of ethics. When it comes to direct quotes, Indians are more lax about the words put in between quotation marks. I think this also stems from the fact people speak a mix of Tamil and English, so flavorful parts are selected and translated accordingly. But what would normally be paraphrased in the U.S. could possibly be found in between quotes in an Indian paper, and it is not considered unethical because the person still “said it,” in effect. In the same way, in television media, blood, guts, and scandals sell just like in the U.S., but there’s bit more “acting” done than “capturing.” From what I gathered, this doesn’t seem to be breaking any ethical code. In fact, to tell the subjects to “do” something rather than wait for the action is almost considered a standard. 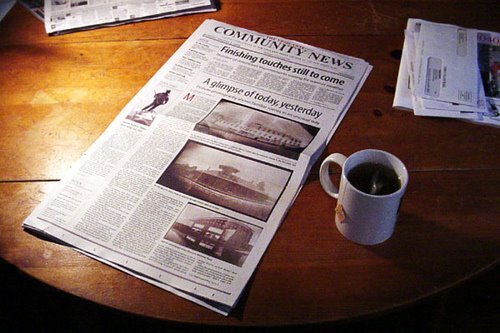 Newspapers in India are still flourishing, or at least, facing only minor cuts, because there is still a certain part of the population that is starting to emerge as literate (which was not previously the case) and it will still take some time before these people start turning to online resources for their news. In contrast, I was very depressed when I arrived in L.A. Airport and purchased a much slimmer, narrower copy of the New York Times. I was even more depressed to find the Gainesville Sun, the local paper in my hometown had followed the same format (as it is affiliated with the Times) and was reduced to a mere few pages. I know today people find it easier to surf the web for their news and have updates sent to their email and Smartphones, but you have to agree — the content in newspapers is juicier. You get a lot more details, background information than you can with little tidbit tweets or spots on t.v. You have the chance to mull the subject over, think about what you’re taking in. There’s a certain thrill I get when I feel the weight of the paper pull apart as I open the pages in the morning to find long editorials and articles….rather than ads that take up most of the space now. While there were only some superficial differences that I noticed about journalism in India, one this is certain: the papers aren’t facing the same dismal fate as the papers here in the U.S. and I don’t think they will unless the “recession” worsens or is prolonged. Sure, there has been some consolidation and effort to not waste space, but there hasn’t been major chopping of material or of staff. I came back to the U.S. because my internship ended and I plan to settle here, but if journalism continues down this path, I may just have to reconsider and head back to the heat of Chennai.